Opus 910 UHF, Wireless system from Beyerdynamic in the OPUS series. At the NAMM show in Anaheim, beyerdynamic launches its new wireless Opus 910. 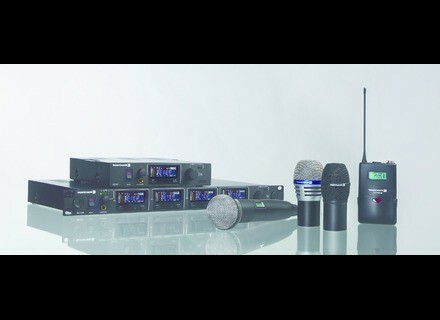 Designed for use either on tour or in fixed installations, the Opus 910 UHF wireless system offers a selection of receivers (single, double and quad channels), transmitters and interchangeable microphone heads, plus a range of accessories and the option for PC control for advanced system set-up. The receiver offers UHF bandwidth of 72 MHz and up to 2880 selectable frequencies per frequency range plus an automatic channel targeting function (ACT). For the US, the system is offered in different frequency ranges between 482 MHz and 698 MHz. Three receivers (single, dual and quad channel) are available, each offering 2880 freely selectable UHF frequencies per frequency range and a number of pre-programmed frequency groups. The front panel of the receiver has a volume-controlled headphone output for monitoring individual receiver channels. Other system settings, such as squelch or the output level of the receiver are made centrally by the optimized jog wheel. The color LCD is designed to be readable from any angle and shows important system information such as frequency, group/channel, user name, field strength, audio level and remaining battery capacity of the transmitter. All receivers are fitted with an internal switching power supply (100-240 V), while the dual and quad channel receivers each contain an integrated antenna splitter. There are two handheld transmitters available for use with the Opus 910 wireless system each with different frequency ranges. The handheld transmitters feature a 36 MHz UHF bandwidth designed to reduce the number and strength of intermodulation products. The handheld transmitters are equipped with an ACT interface designed to detect the carrier frequency from the receiver and set up the transmitter automatically. They also have an on/off switch and LCD showing channel/group and remaining battery capacity. Two 1.5 V AA alkaline batteries are designed to power the S 910 M (with metal housing) for about 20 hours, whilst the S 910 C (with plastic housing) has integrated charging contacts and is delivered with built-in rechargeable batteries (2 x Mignon AA NiMH) which are designed to provide an operating time of 23 hours. Both transmitters can be combined with five interchangeable beyerdynamic microphone heads. The TS 910 C is fitted with two built-in rechargeable batteries (2 x Mignon AA NiMH) designed to provide an operating time of 23 hours. The batteries can be recharged using the SLG 900 battery charger with two charging compartments. Two 1.5 V AA batteries are designed to power the S 910 M for 20 hours. The Opus 910 UHF wireless system will be available as of February 2011. For more information, visit www.beyerdynamic.com. [NAMM] QSC KLA Series The KLA Series is an active line array system designed for a range of portable and permanently installed applications ranging from live entertainment to houses of worship or other venues, according to QSC. [NAMM] Turbosound TCX Compact Series Making their debut at The NAMM Show, the new Compact series offers four passive two-way loudspeakers, and a choice of two band pass subwoofers. [NAMM] Wharfedale Diva 6 Wharfedale Pro has announced an addition to their range of installation loudspeakers, the Diva 6, a surface mount installation loudspeaker.